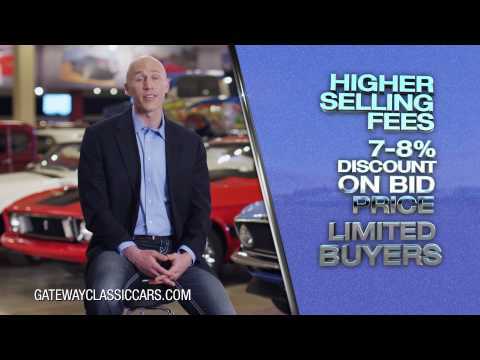 Selling your car has never been easier thanks to Gateway Classic Cars. With 20 years of experience, you get nothing but superior service. We make it easy for our sellers by using the most simplistic consignment process. Our team will take the stress off you from selling privately and the risks of losing money at auctions. You will get the utmost dedication from our sales team working to sell your car 8 hours a day, 6 days a week. Join our success of being the World's Largest Classic Car Company since 1999. Personal security – No strangers coming to your home. What is your personal security worth to you? Fill out the consignment form below and a Gateway Classic Cars Inventory Consultant will contact you. Bring your car to one of our 16-showrooms. Your car will get a professional photo shoot of up to 100 pictures and a video presenting your vehicle plus a professional write-up. It will then be featured on our website and 260+ car selling websites. Go home and relax, play golf or go fishing and let our professional staff market your car to a global audience. When your car sells, bring your title to us and go home with a check and a BIG smile. If you want to sell your Classic Car, we can get you a higher value for your classic or exotic than any auctions or on your own. Contact us and learn about how we can sell your car or, fill out this brief form above and we will contact you.